Welcome to the official website for the Emerald Isle Marathon. Registration is now open! Packet Pick up and Expo: Emerald Isle Gym from 3-9pm on March 29. Hello runners! We hope that you will join us for our sixth annual race on March 30, 2019. As promised, each year we choose a new charity that will benefit from the race proceeds. We will announce this year's charity soon! We look forward to another fantastic response! This race will be even better than last year's and we can't wait to see you there. We have tried to answer some of the more common questions. However, if we have not addressed your question, please feel free to contact us on Facebook or through e-mail. Can I download a Race Information Packet? Packet Pick up and Expo: Emerald Isle Gym March 29 from 3-9pm. Will we race in the rain? Yes, rain or shine, we run! If there is lightning, we will postpone the start time until it hopefully passes. I can't make it to the race, can I get a refund? We will not give any refunds. The course will close 6 hours after the start. Yes. Marathon: 3:05, 3:30, 4:00, 4:30 and 5:00 hours. They will be carrying signs with these times listed and will be in uniformed shirts. There will be volunteers and signs showing you where you can park the morning of the race. No, sorry no pets on the race route. Can I register for the race at packet pick up? Yes, if it has not sold out. You will not be guaranteed the correct shirt size if you register at that time. No, we no longer offer this option as it was over used in the previous race. 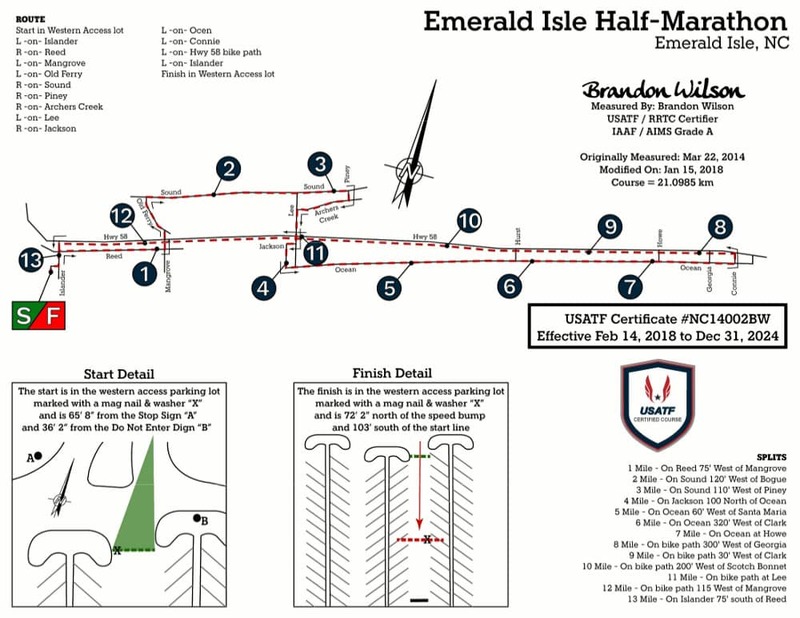 Can you mail my participant packet to me if I can't make it to the race? No, sorry. We cannot mail packets. Can I change to another race distance? Yes. All changes must be made no later than 7:15am. You may only downsize to a shorter distance. No refunds will be provided. All marathon and half marathon participants will receive a medal at the finish. Are there caps for each race? Yes, all registrants will receive an official race technical tee. Will there be water stations along the route? Will there be awards again this year? Yes, there will be age group awards in all 3 races! Be sure to stick around to find out if you are a winner! All runners are invited to The Growler Taproom, located on the corner of Mallard Drive and NC 58 (you’ll run right past it near the Start / Finish line!) for free post-race food and great beer for purchase. After Party starts at 10 am and will last until…….! Yes. There will be a tag attached to each bib and items may be checked in at the start/finish line under the tent. 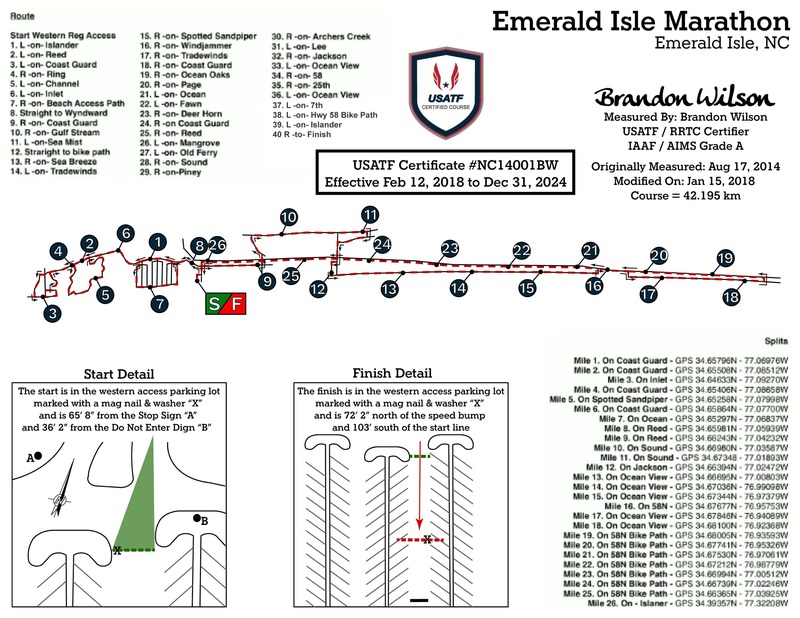 What are the USAT&F Certification #'s? Strollers are only permitted in the half marathon and the 5k. NO strollers are permitted in the marathon. Yes, we understand the importance and need to have your music for motivation during the race. We do ask that you remove one headphone when approaching intersections and/or race officials. We don't want you to miss any directions they may be providing. May someone else pick up my packet? Yes, you may send someone else to pick up your packet. Will you have medical staff available? Yes, we have an RN and multiple EMTs located at mile 18. We also have the Emerald Isle EMS at the start/finish along with an MD and RN. Average morning temperatures are in the 40s and warm up into the 60s. March weather can be fickle, of course, so plan accordingly. Islander, Emerald Isle NC: For reservations, call the hotel direct and ask for the Emerald Isle Marathon Rate or group Code EIMB032919 to receive the discounted rate. Or visit the website and click on reservations, put in your arrival/departure date and then click on "Do you have a group code". Type in EIMB032919 to receive the discounted rate. Best Western, Cedar Point NC: For reservations, call the hotel direct (252-393-3654) and ask for the Emerald Isle Marathon Rate or group Code EIM to receive the discounted rate. Parkerton Inn, Cape Carteret NC: For reservations, call the hotel direct (252-393-9000) and ask for the Emerald Isle Marathon Rate or group Code EIM to receive the discounted rate. There will be ample parking at multiple locations for the event. In addition, everything will be clearly marked so please follow the directions of the attendants. We look forward to seeing you! Participants in both races should park in the NC 58 grassy right of way on both sides of NC 58 between Islander Drive and Woodpecker Lane. Please pull completely off of the NC 58 shoulder and into the grassy area, and please utilize the full area between the NC 58 shoulder and the bike path or sidewalk. Please park at a 45 degree angle to allow for more efficient parking in this area. 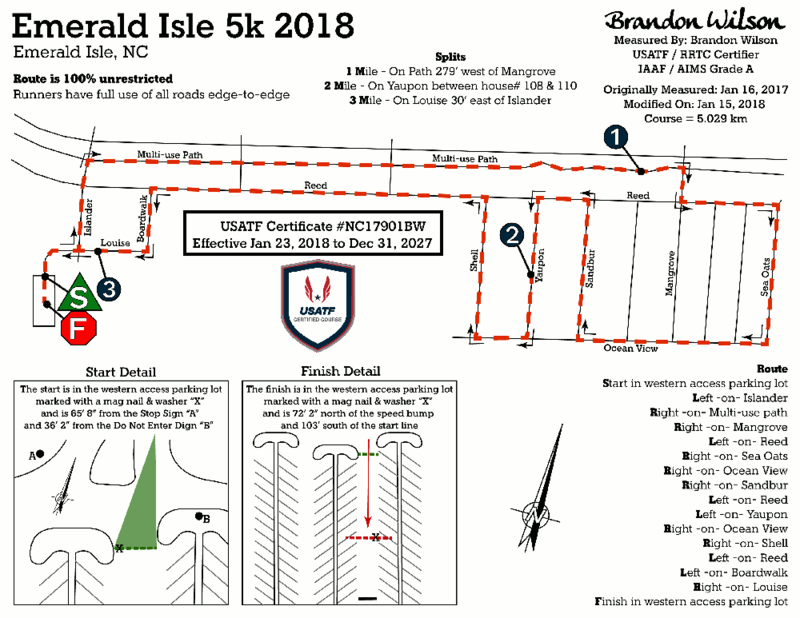 Emerald Isle Police Department personnel and signs will be in place on race day to direct participants to the authorized parking areas, and a map indicating the authorized parking areas is attached. Handicapped parking is available at vacant lot at the corner of Reed and Islander, located on the southeast corner of Reed Drive and Islander Drive (8915 Reed Drive). To become a sponsor, your information must be submitted by February 20, 2019! This year we have created sponsorship levels. 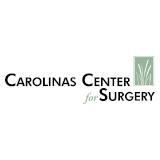 As a gift to the community, this website donated & maintained by Crystal Coast Technologies, Inc.